Special Offer. Buy 2 Bottles for £190.00. Save £10.00 !! Just as composer Antonio Vivaldi dedicated a concert to autumn, his N°3 in F-major, Maison Perrier-Jouët's Chef de Cave Hervé Deschamps has created his own homage to this suggestive season. "In autumn one reaps the fruits one has sowed and begins to dream" he said in presenting this novelty for the Champagne world: a seasonal cuvée that is ideal to enjoy in a particular period of the year and that is sold for only one season, given the very limited number of bottles available. Maison Perrier-Jouët's idea was to dare to break classic stereotypes and produce a Champagne that brought together aromas that were identifiable to a certain season, just as they had done with their Belle Epoque Première 2007, which was dedicated to spring. With Epoque Edition Automne 2005, a decidedly unique rosé Champagne in the Belle Epoque line, nature offers the warm sensations of autumn, beginning with the wine's colour obtained with the 15% addition of Pinot Noir fermented on the skin that gives the wine a gutsy and winey character. While the blend is the classic one for a Belle Epoque - 45% Chardonnay, 50% Pinot Noir and 5% Pinot Meunier - this Champagne is completely different and is surprising for the way it blatantly expresses the fruit, while maintaining tension between its vigour and finesse creating a balance that is quite remarkable. Hervé Deschamps has a particular fondness for autumn and observed: "in autumn the vineyards in Champagne create an enchanting patchwork of colours that vary depending on the variety of grape. The rows of Chardonnay have a golden-yellow glow, while those of Pinot are fiery and dark red. Autumn is also a season of aromas with the morning mist bringing out scents of humus, while as the sun rises the scents of the grape bunches and their juice emerge. Autumn is above all the season when the fruit ripens fully to allow for the long-awaited harvest to begin". Belle Epoque Edition Automne 2005 is a brazen novelty for the Champagne world, a Champagne that underscores even more clearly the particular rapport between the Maison Perrier-Jouët and Nature. 10g/l dosage (Brut) - letting the wines express fully. 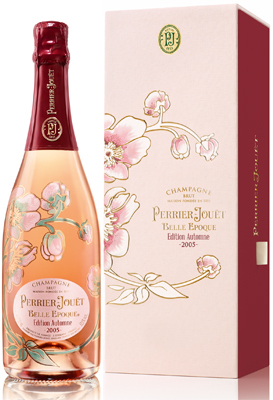 Hervé Deschamps, Perrier-Jouët's Cellar Master, decided to pay tribute to the beauty of Autumn, creating a new Belle Epoque rosé cuvée: Belle Epoque Edition Autumn 2005. Combining autumn's engaging and voluptuous qualities with its vitality, he has translated such subtle harmony into this cuvée, a wine that conveys every single facet of a season as diverse as it is mesmerising. 2005 was a year whose contrasts echo those of autumn itself "A harsh winter, a warm spring followed by a curious, cool summer and a sunny autumn"